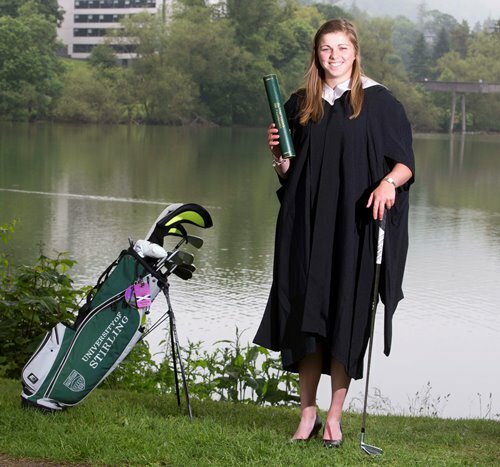 Olympic Rowing legend Sir Steve Redgrave provided the inspiration for University of Stirling BA Hons Sports Studies graduate Hannah McCook to excel…in Golf. Hannah, from Nethy Bridge in the Scottish Highlands, collects her degree scroll from the School of Sport at the second of three Stirling summer ceremonies. She is one of 13 graduates this summer who received support through the University’s International Sports Scholarship Programme, alongside the likes of fellow Scotland international golfer Jack McDonald and British 200m Butterfly Swimming Champion Cameron Brodie. It is a special moment for the 21-year-old, whose golfing prowess whilst at Scotland’s University for Sporting Excellence has seen her selected to represent Great Britain at July’s World University Games and at a Ladies’ European Tour Event of her choosing. But it isn’t just undulating greens and tricky tee shots which Hannah has to contend with on the Golf course, for just like Sir Steve, she is also a Type 1 Diabetic. “I was diagnosed aged eight,” recalls Hannah. “I had flu-like symptoms for a few days then I was up being sick one night and diagnosed in hospital the next morning. At first, I literally didn’t have a clue what Diabetes was. I was into lots of sports and my mum and dad researched diabetic sports people and up popped Sir Steve. When they told me about him that was it for me – I wanted to keep playing sport and I’ve never stopped. At first, Hannah required five injections a day, but she has recently switched to use an insulin pump, which enables her to better regulate her condition. It does, however, mean lugging an extra heavy bag around the course, packed with Bananas, Jaffa Cakes and Jelly Babies. Read Hannah's full story and more from graduates at our 2015 Summer ceremonies at Graduation Live. Summer 2015 graduates of the International Sports Scholarship Programme are: James Drummond and Matthew Sheridan (Football); Hannah McCook, Jack McDonald and Angus Carrick (Golf); Ryan Bennett, Cameron Brodie and Jak Scott (Swimming); Jordan McCulloch and Adam Stevenson (Tennis); Marc Austin, Natalie Milne and Russell White (Triathlon).